Guests wishing to explore the charms of the Andalusian capital will find our hotel the perfect starting point from which to discover the enriching culture and heritage of Andalusia. This area has a very rich historical background and unique monuments. In addition to the cultural heritage, the area also has a wide variety of museums, as well as shops and restaurants which will delight anyone who wishes to discover this wondrous city. 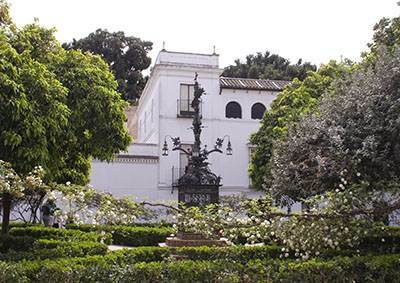 Located in the heart of Seville, the Real Alcázar of Seville, which was built in the Middle Ages, is the oldest Royal Palace that is still in use in Europe. A unique landmark, composed of several Moorish style palaces and dreamlike gardens, surrounded by a majestic stone wall. The fortress built by Abd Al Raman III, is formed of exquisitely decorated rooms with plasterwork, tiled and coffered ceilings, which combine with the splendid gardens and water, to create a truly unforgettable setting. 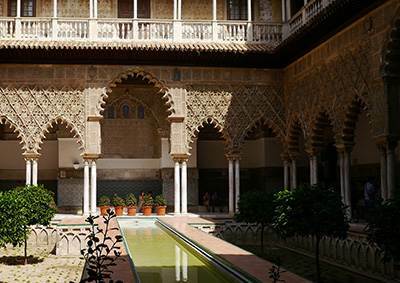 The Palace of the Maidens stands out for its beautiful tiles, or the Patio de las Muñecas, which has an interesting collection of columns with decorative capitals. This wonder is the largest gothic cathedral in the world and the third largest Christian church in Europe. 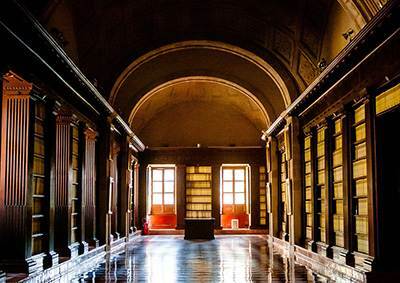 In 1987, it was awarded the title of World Heritage Site by UNESCO, along with the General Archives of the Indies and the Reales Alcázares, and on 25th July 2010, declared to be of Outstanding Universal Value. 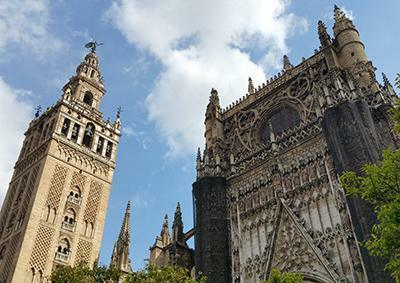 Built over the ruins of a 15th Century mosque, whose Minaret is now known as the Giralda Tower, it houses unique treasures, relics and the remains of Christopher Columbus. Is the most famous park in the city and one of its green lungs. In 1983 it was declared of Cultural Interest in the Historical Garden category, and is home to the Plaza de España and Plaza de America, built for the Ibero-American Exhibition of 1929. It has more recently been used as a location in the Star Wars movie: Episode II: Attack of the Clones, by George Lucas. Such is the magnetism of the Santa Cruz neighborhood that even the American writer Washington Irving (1783-1859) stayed in the area before setting off to Granada to write his Tales of the Alhambra. The Santa Cruz quarter was the former Jewish quarter of the medieval city and its narrow intertwining streets and little squares are a beautiful reminder of bygone days. One of the most iconic neighborhoods in Seville, situated on the other side of the Guadalquivir river. 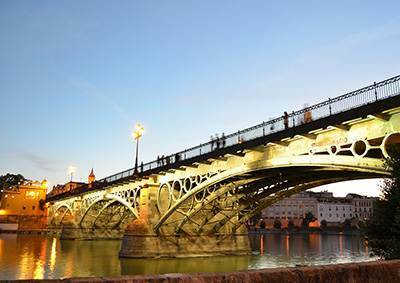 It is linked to the city centre by the Isabel II bridge, and has been the birth place of many important artists in Southern Spain. Nowadays, it is a lively area with many bars and terraces, perfect for strolling down its streets and discovering the roots of Andalusian culture. In 1785 King Charles III decreed that all of the General documents concerning the administration of the Spanish colonies were to be kept here. Until then they had been kept in various archives: Simancas, Cadiz and Seville. The archive preserves about 43,000 files, with about 80 million pages and 8,000 maps and drawings referring to the discovery of America. Declared Patrimony of Humanity by Unesco in 1987, it is located next to the Cathedral and the Reales Alcázares. 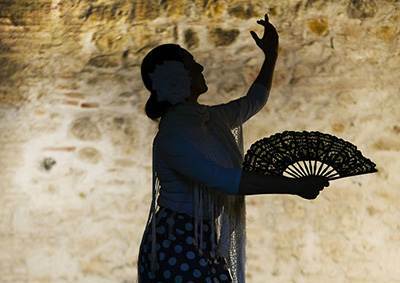 Live Seville and its gastronomy, and discover the world of flamenco. Enjoy the dancing and singing with real professionals. 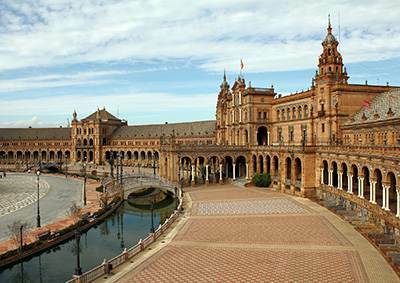 Seville is the ideal location from which you can visit the rest of Andalusia. Málaga or Granada. Take the A-92 Motorway. 200kms. 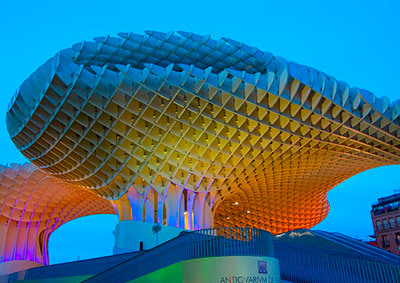 Mushrooms of Seville , also known as Metropol Parasol architect Jürgen Mayer project is the wooden structure of the world’s largest and construction was carried out with the aim of renewing the Plaza de la Encarnación in Seville, in the autonomous community of Andalusia (Spain). Since opening the Mirador de Sevilla Mushrooms , it has become a major tourist attraction in the city of Sevilla and a must see for tourists. Because there is no better way to enjoy Seville from the heights with a panoramic vision to enjoy its beauty and breathe. 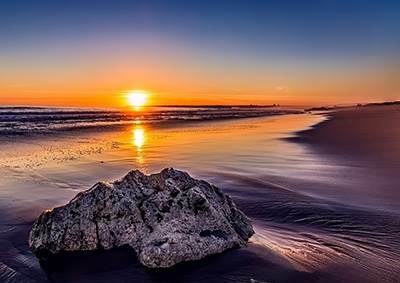 It’s the ideal place to enjoy beautiful sunsets, relax and take pictures with magnificent views.